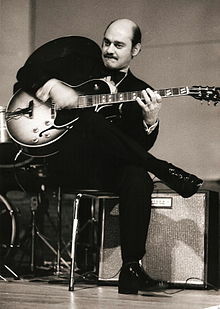 In addition to his ensemble performances, the jazz community regards Joe Pass as an influential solo guitarist” . There is a certain purity to his sound that makes him stand out easily from other first-rate jazz guitarists.”His solo style was marked by an advanced linear technique, sophisticated harmonic sense, counterpoint between improvised lead lines, bass figures and chords, spontaneous modulations, and transitions from fast tempos to rubato passages. He would regularly add what he called “color tones” to his compositions, to give what he believed was a more sophisticated and “funkier” sound. He would often use melodic counterpoint during improvisation, move lines and chords chromatically or play melodies by solely shifting chords, and descending augmented arpeggios at the end of phrases. Pass’s early style (influenced by guitarist Django Reinhard and saxophonist Charlie Parker), was marked by fast single-note lines and a flowing melodic sense. Pass had the unusual lifelong habit of breaking his guitar picks and playing only with the smaller part. As Pass made the transition from ensemble to solo guitar performance, he preferred to abandon the pick altogether, and play fingerstyle. He found this enabled him to execute his harmonic concepts more effectively. His series of solo albums, Virtuoso (volumes 1 through 4) are a demonstration of Pass’s refined technique.